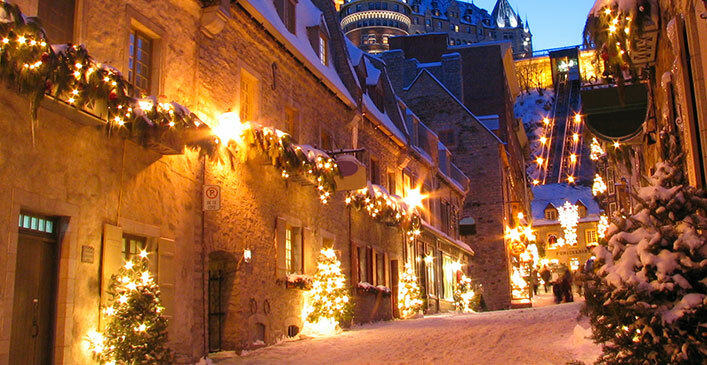 One of Canada’s most historical cities, Quebec City is a beautiful picturesque winter wonderland in February. They host a yearly winter carnival that’s final day of celebration is Valentine’s Day. Filled with snow and ice sculptures, canoe races, nightly parade and snow bath, you’ll feel like a kid again enjoying the carnival. Retreat in the evening to North America’s only ice hotel, located just 10 minutes from the city center, and experience what it’s like to sleep inside an igloo. With multiple accommodation options, you can snuggle up together inside a room entirely made of ice and stay warm by a crackling fireplace. Within the hotel compound there is also a romantic outdoor spa and sauna open only in the evening so you can enjoy the moonlight and relax under the night sky. Throughout your stay you can take in this city steeped in history on guided tours through many different historical sites and landmarks. A must-see location is the Fairmont Le Chateau Frontenac. Built in 1883, the hotel is a pillar in this city and can be seen from miles away, with its central tower standing 260 feet. With helicopter and hot air balloon tours, city bus tours, and even private tours by limousine, you will fall in love with this romantic location. There are so many places worldwide that boast spectacular scenery, landmarks and luxury; it’s hard to choose which place is the perfect location for a Valentine’s Day getaway. Whether you are looking for something tropical or somewhere cold so you can snuggle, these are just a small sampling of the thousands of spectacular destinations in the world. If travel isn’t in your budget, research your own city and discover what the tourists are experiencing. You may find things within your own town that can become a new Valentine’s Day tradition, where you can return year after year to celebrate your love. Whether it be on the beach in Hawaii or your dining table, eating take out by candle light after the kids are in bed, Valentine’s Day is what you make of it. As long as you are together, wherever you are is the best place on earth.